Topo-guides for cyclists include all necessary information to plan your road cycling route. The topo-guides contain maps and route planners for each stage, elevation profiles and difficulty rating based on IBP indicators, cumulative elevation gain, distance between two points, list of bike repair shops, etc. The route planner indicates the route and possible diversion routes as well as road classifications and type of road, hard shoulder types, road surface condition and traffic volume. The topo-guides also include information about some of the natural and historic and/or artistic sites along the route. Download all relevant information on PDF for free. File size is reduced and it takes up little printing space (8 sheets of paper). 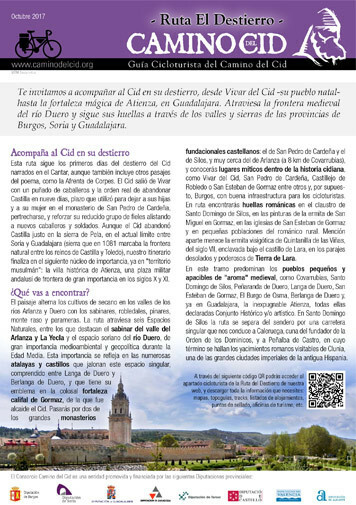 Edited by Consorcio Camino del Cid. Digital format: free download from website.